Rigid gas permeable contact lenses are known to offer superior optical quality with high oxygen permeability, surface wetability and less lens deposit than soft contact lenses. The rigid surface provides intrinsic ability to correct corneal astigmatism without rotational instability. This is especially beneficial for patients with a high astigmatism prescription or irregular corneas. However, most soft contact lenses are easier to adapt hence offer better initial comfort. The hybrid technology combines a rigid gas permeable contact lens at the center with a surrounding soft contact lens skirt. It allows these lenses to offer the crisp vision of a rigid gas permeable contact lens with the superior comfort of a soft lens, truly the best of both worlds. In 2009, SynergEyes won the most innovative new product award from CONNECT, one of the nation’s most successful regional economic development programs for high technology and life science innovators. SynergEyes lenses will keep your vision clear with all day comfort. Dr. Chang has extensive experience fitting these lenses. She was actually one of the first practitioners to fit SynergEyes ClearKone lenses in the Boston area. She has fitted many patients with keratoconus, high degree of myopia, hyperopia and astigmatism. Her patients have excellent results and have remained loyal to these lenses. The wide variety of lens design and perimeters from SynergEyes offers extensive ability to meet your visual needs. 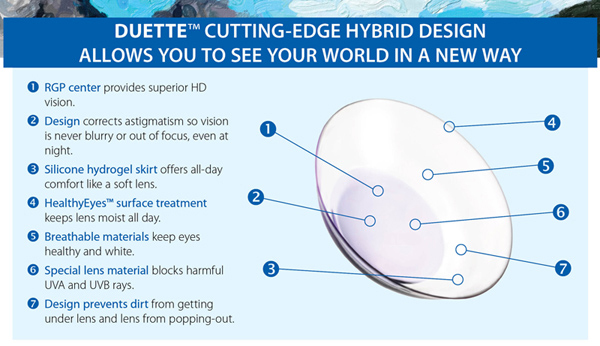 The newly launched SynergEyes Duette lens has become Dr. Chang’s first choice for fitting regular corneas when the conventional soft lenses can not satisfy the visual demand. She will measure your corneas with keratometry and corneal topography to determine which design will be the best for you. SynergEyes ClearKone lens is FDA approved for treatment of keratoconus. 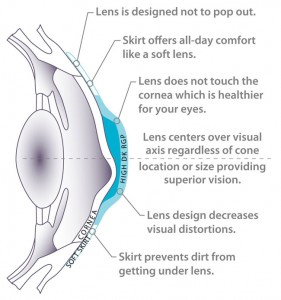 The rigid center of the lens will cover the irregular corneal surface to create a uniform optical refractive surface to minimize distortion; while the soft skirt will prevent lens dislodge and increase stability. ClearKone lenses allow keratoconic patients to see clearly with all-day comfort. We recommend the Sauflon One-Step lens care system for cleaning and storing lenses and preservative-free saline for rinse and fill the lenses before insertion. The Sauflon One-Step System combines a non-ionic cleaner with effective hydrogen peroxide for disinfection as well as a lubricating agent to enhance wearers’ comfort. Gently rub the lens with the Sauflon One-Step solution, and then place the lens into the basket. Care must be taken not to press or squeeze the lenses excessively during handling as this may lead to lens distortion and breakage. Fill the container with hydrogen peroxide to the marked level. Insert the basket into the container and screw the lid closed. During the following 6 hours the platinum disk catalyst will neutralize the hydrogen peroxide (H2O2) into isotonic saline solution (H2O) and oxygen (O2). The O2 gas will escape thru a pressure valve in the top of the container leaving the lens soaking in the saline solution. After the 6 hours of neutralization period the lenses are safe to be re-inserted into the eyes. Replace the cylinder case with each new bottle of solution. It is important to ensure that the hydrogen peroxide has been completely neutralized (by allowing at least 6 hours of soaking) before placing the lenses back into the eye. Failure to do so will result in severe chemical burn to the cornea.